Are you one of those fanatic card lovers who would always prefer playing cards to reading a good book and even worse- watching a relaxing movie with the better half? Well, if so, right on the spot you are. Here are some pretty enjoyable variations of card games for two which will enable you to play with just one more card enthusiast like you, a friend or a family member… while drinking a homemade lemonade with your slippers on and in the comfort of your home. Priceless! Being a variation of classical Solitaire, it’s one of the most elegant card games for two players. The main object is putting down all your cards after rearranging the deck by suiting and ranking the cards in a series of moves. Most of the rules are the same as in the classical version, excluding the competitive twist- one of the players decreases pile while making the opponent pile bigger. It’s also widely recognized with the name Patience. Already guessed why? Right, it’s definitely the best time killer of all times. It’s a pretty interesting 2 player card game most popular in Germany. It involves a dosage of strategy and can be undoubtedly considered as a trick-taking card game. Math skills are definitely a must should you desire to be the ultimate winner in this game. This card game for two boasts a very engaging and smart gameplay. It can be played for ages especially if you are that sort of brain-teasing lover. A very enjoyable card game of 2, most popular in the United States. It can be considered as a solid family game. When two people play, the winner of each hand deals the next. When more than two people are involved, the deal passes to next the player on the left. Each player has the goal to shape matched sets consisting of groups of 3 or 4 of a kind, or sequences of 3 or more cards of the same suit. If you have Russian friends, ask them about their experience with Durak, an original Russian card game that can be the perfect fit for 2 players only, still keeping its potential to entertain a whole bunch of card lovers if needed. Now, this is one very classic and dynamic 2 players card game, all about speed and fast reflexes. It’s a jungle of fun, yet helping you push your concentration and counting skills to the limits. The winner is the one who gets rid of their cards first. What’s the best about it- it’s more relaxing than brain teasing so it’s brilliant for a quality chill out with a friend of yours and a glass of frozen mojito. Yes, a bit childish you would say, but admit it- it’s tons of fun after all. The ultimate goal is as easy as that- it simply requires to war over the card of your opponent to never run out of cards. This practically makes the gameplay kind of endless. In general, this game is not a brain-teaser but relaxing and engaging way to spend some quality family time with your kid, so never underestimate this card game for two. Better give it a try! It’s a speed matching card game which boosts adrenaline and provokes fast reactions. Being a card game for two or more players, the objective requires taking as many cards as you can to become the winner. It slightly reminds of the old game named Beggar-Thy-Neighbor but what makes it stand out from the other similar two player card games, is the following rule: The players may only slap the cards if they are firstly gathered in special combinations. Often referred to also as binocle, Pinochle is a classic and one of the best 2 player card games originated from the US. It’s a trick-taking card game using a 48-card deck. The players strive to win tricks, score the value of cards and meld certain card combinations thanks to the values in points. Poker is the total blockbuster in the card games collection. As they say, it may take a day or a year to learn it but a lifetime to master it! Amongst the innumerable variations Texas Hold’em is the most popular poker types of all. If wondering, you can sure play poker as a card game for 2 people only. 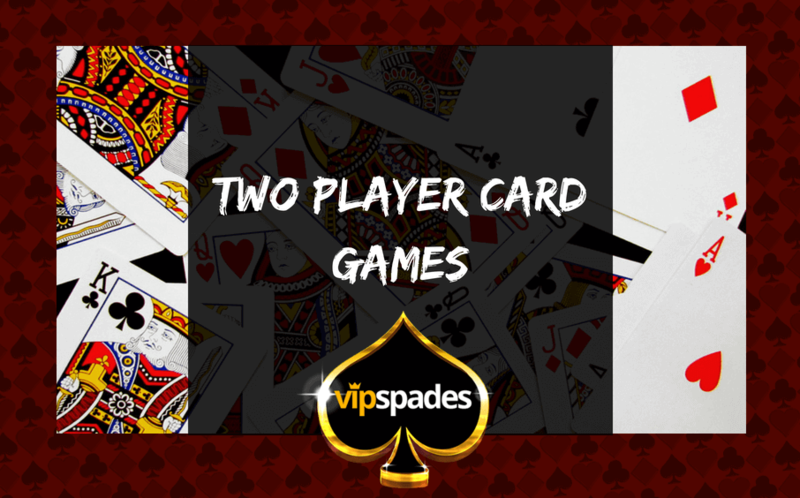 Firstly, make sure to explore the certain rules for playing 2 player poker that might apply. Now we have shortlisted for you 3 of the very best and most lovable two player card games ever. Dip into the mechanics of these emblematic card games for 2 people and learn how to play to become the ultimate master. How to play Spades with 2 people? It is one of the most admired card games of all times. Usually played by two partnerships, but very appropriate for 2 players as well. It’s played with a standard 52-card deck where the Ace is high; the 2 is low. The winner is deemed to be the first player to reach 500 points. The deck is standard 52 – card deck and 1 or 2 Jokers may be added. The first dealer is chosen by a draw for “first spade” or “high card”, and then after each hand, the deal passes to the dealer’s left. The dealer shuffles and the player to the right is to “cut” the cards to avert the dealer from stacking the deck. The entire deck is then faced-down in clockwise order with one card at a time. The players then take their cards, count to ensure the right number received and if all is properly set, arrange them by suit and rank. Players bid the number of tricks expected to be taken. The one standing at the left side of the dealer starts the bidding which goes in a clockwise direction, ending up with the dealer. A bid of “zero” is called “nil”; the player must bid at least 1, not to bid “nil”. Each hand includes a number of tricks (the 4-handed game contains 13 tricks using all 52 cards). The player on the dealer’s left makes the opening lead by playing a single card of their choice. Players in clockwise direction play a card with the obligation to follow suit if they can. If not they can play any card, including a trump Spade. A general rule, taken from Hearts states that a player may not lead Spades until a Spade has been played to trump another trick. This stops a player who holds a large number of Spades from leading Spades one after the other at the beginning of the hand to deplete other hands, blocking the opponents from using them as trumps. The action of playing the first Spade in a hand is called “breaking Spades”, rooting from its original rule, “Breaking Hearts”. When a player leads with a spade (after Spades have been broken), the other players must follow suit. Another common rule, also been borrowed from Hearts, says that a player is not allowed to lead Spades in the first trick. The trick is considered to be won or taken by the player who played the highest card of the led suit – or if trumps were played, the highest trump card wins. The winner of the trick gathers the cards up into a face-down arrangement aiming to allow players to count the number of tricks taken. The number of tricks a player has won cannot be disguised; if asked each player must count out their tricks until everyone agrees on their “trick count”. The player who wins any given trick leads the next. Play continues until all players have run out of their hands, which should occur on the same (last) trick. Otherwise, it is alleged as a misdeal. How to play Whist with 2 people? This is a two-player version of Scandinavian Whist, also recognized as Norwegian Whist. We should state it differs quite a lot from the most popular two-player game called German Whist. What makes it unique is the rule that each player plays 2 cards to each trick. A standard 52-card pack is needed. The cards are ranked from high to low A-K-Q-J-10-9-8-7-6-5-4-3-2. Turn to deal alternates. The dealer shuffles, the non-dealer cuts. 26 cards are dealt to each player, one at a time starting with dealer’s opponent and alternating. In the beginning, each player is dealt 8 cards face down on the table in a 4x2 rectangle, after another 8 cards face up on top of the face-down ones, then a hand of 10 cards follows. This means that each player has 10 cards that only they can see (in the hand), there are 16 cards down that can’t be seen by any of the players and then 16 more face-up cards that can see by both players. To start with – the non-dealer bids “high” or “low”. If high, it’s then called a high game and the dealer has no say. However if low, the dealer should bid “high” or “low”. If the dealer defines it as high, it’s a high game. If both say low, it’s a low game. In a high game the goal is winning tricks, and in a low game to the contrary- avoiding winning tricks. When the game is low- the non-dealer leads to the first trick. In case of a high game, the first lead is by the player who did not bid high. Therefore the only case where the dealer leads first is when the non-dealer bids high. Each trick includes 4 cards, 2 from each player. At your turn, you can play a card from your hand or one of the cards in your face up layout. Right after a card from the layout is played, if this uncovers a face-down card, the latter is immediately turned face up, before any other cards are played by either player. Any card can be led. The rest 3 cards played should possibly follow the suit. So if the leader’s opponent has any cards of the same suit as the led card, either in hand or face-up on the table, he is obliged to play the card. Then the leader is obliged to play a second card, also following suit to the card led if possible, and in the end, the opponent plays a second card, also possibly following suit to the original lead. The four-card trick is won by the highest card of the suit led and the player who wins the trick leads to the next. How to play Blackjack with 2 people? To avoid any mischief information, you should have in mind that in the UK there is another card game called Black Jack but it’s entirely different one, more or less similar to Crazy Eights. The popular Blackjack card game, also known as 21, originates from North America and we can call it the ruby of casino games not only in the States but all across the globe. Beaten only by the poker, it’s the best gambling card games by popularity. It can be perfectly played as a 2 player card game. At the start of each new game, the players and the dealer are dealt two cards each. The players’ cards are normally dealt face up, the dealer has one face up and one face down. The best Blackjack hand is an opening deal of an ace with any ten-point card. A standard 52-card pack is involved, but a predominant part of casinos use to shuffle several decks of cards together which makes it a six-deck game – 312 cards. The players attempt to beat the dealer by getting a count as close to 21 as possible. That’s the overall objective of the game. The cards are duly shuffled by the dealer and then a random player cut the pile. Face cards are 10 and any other card is its pip value. The player is the one to choose the worth of an ace – either 1 or 11. When all the bets are registered, the dealer gives one card face up to each player in a clockwise manner, and then one card face up to himself. Another round of cards is then dealt face up to each player where the dealer takes his second card face down so everyone except him receives two cards face up while he receives one card face up and one face down. The bets widely vary from $2 to $500 in general, since there are minimum and maximum limits set. The player to the left goes first and should choose whether to “stand” (not asking for another card) or “hit” (asking for another card to try to get closer to a count of 21 or even hit 21 exactly). Therefore, a player may keep the originally dealt cards, or ask the dealer for extra cards, one at a time, until he either decides to stand on the total (if 21 or under), or goes “bust” (if over 21). In case of the second scenario, he loses and the dealer collects the bet and serves the next player to his left in the same way. “Soft hand is called the combination of an ace with a card other than a ten-card, because the player can count the ace as a 1 or 11, and either draw cards or not depending on the current cards count and what he considers to be a better move for his strategy. In a nutshell, we should admit that the card games for 2 can be a fantastic way to chill and have fun, simply having a deck of cards and just one opponent to share the joy. So which of the mentioned 2 player card games is your pick for tonight?